A week ago, the news buzzed around town about the winter storm that was about to roll in, bringing with it record ice-fall followed by several inches of snow. Fluffy-white snow is welcomed, but ice is another story. Thick layers of slippery ice covering the roads, trees and powerlines is a recipe for danger, so being prepared is a good thing. I, along with most of the townsfolk, rushed to the market to stock up on food, water and other necessities, knowing that in just a few hours the roads would be too hazardous to travel. For me, all of this commotion is very exciting! I love making the necessary preparations and hunkering down before a storm hits. All safe and cozy inside with the fire blazing….soup simmering…. the pantry stocked….making sure we have candles and flashlights ready….you never know if the power will go out (which it did!) it all seems a like a scene from Little House On The Prairie (minus the flashlights of course!). Laura Ingalls Wilder had experienced many wind-howling blizzards right here in the Ozarks. Just one hour from where I live, in the little town of Mansfield Missouri, sits Laura’s homestead, a place that she and her beloved husband Almanzo, named Rocky Ridge Farm. Her homeplace is now a museum filled with simple furnishings of a rich life. This is also where she penned all of her Little House On The Prairie books. Oh! If only those walls could talk! The kitchen table in the Wilder’s kitchen. How sweet is this embroidered apron of Laura’s? These same apron strings, tied in a bow, hugged her waist as she set about the domestic joys of cooking, cleaning, and gardening. She knew that her simple, everyday tasks were more than just chores that had to be done, her deeds were an essential part of blessing her family. Laura’s apron was her all-purpose companion. I can just imagine, in the twilight of an early summer evening, just as the sultry heat of the day began to cool, and the cicadas in the trees would begin to buzz, she would walk softly across the damp grass, thick with slow-dancing fire-flies, and into her garden to pick juicy, sun-warmed tomatoes and gently place them in the skirt of her apron, that she had gathered at the ends to create a make-shift basket. I’m sure it was those simple summer joys that warmed her heart as the bitter north wind frosted the window panes of her dear white farmhouse. Well, the winter wind certainly swirled through the Ozark hills this past week, ice clinking against the windows, then the snow fell, fast and hard. Enormous, 3″ snowflakes looked more like cotton balls being thrown from heaven. I think the angels were having a good-hearted snowball fight! In the morning, beauty was everywhere. Crystal trees glowed at dawn. God’s creation sang of His Glory! sledding down a small hill on the side of our house…. Summer had four happy days off from school. Our power went out for a while and then when it did come back on our heater didn’t work. While we waited for the repair man to come, I kept the kitchen warm by baking an old southern favorite, Buttermilk Pie (I’ll share the recipe in my next post). Being snowbound gave us a great opportunity to watch a set of DVDs that I recently ordered from Franklin Springs Family Media, called Homestead Blessings. A mother and her three daughters share their skills on making bread, soap and candles. They live in a horse and buggy community in the Appalachian hills of Tennessee. Oh My Goodness!! I love these gals! 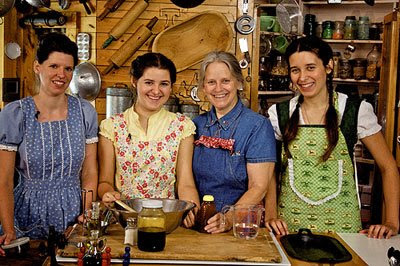 I so want to go bake with them in their adorable country kitchen! 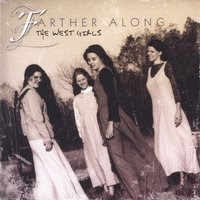 They are called the West Girls and they live life the old fashioned way, off the land, Little House On The Prairie Style!!! They are full of down-home charm and southern hospitality. 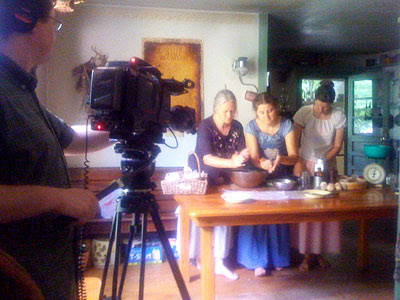 Franklin Springs Family Media produces top quality DVDs that celebrate home and family. Their films highlight families who have built homes of honor. What a wonderful resource for those of us who want to bring honor, integrity, faithfulness, honesty, strength, perseverence, adventure, compassion, grace, and joy into the lives of our family. Click here to see a preview of these homespun DVDs by Franklin Springs. What an inspiration these gals are! While you are at the Franklin Springs Web site, check out their other inspiring DVDs. I can’t tell you how excited I am about this company…I just had to share it with y’all! These adorable West Girls also sing Bluegrass. Click here to see their youtube video “Green Beans In The Garden”, which was also a part of a Franklin Springs DVD titled Inherit The Land. Thanks for stopping by for some “Little House On The Prairie” Pie! Summer is back in school…the sun is shining….snow is melting….I’m getting back into the swing of things….and…God is good. Oh how lovely! Look at all the snow!!! Being in south Florida – I definitely appreciate the beauty of a snowfall! Thanks for sharing, RuthAnn. I love your blog so much I could marry it! Thanks for sharing your warm & cozy ice storm story. We had quite an ice storm event here in Tulsa, but thankfully not bad enough for downed trees & power outages. Can't wait for you to post the pie recipe! You and your blog are an inspiration! I made your hillbilly spaghetti pie last week. It was a hit! Thanks so much for your encouraging words and happy spirit. We got quite a bit of snow and ice here in KY. as well. More on the way today. Thanks so much for the Laura Ingalls Wilder’s Rocky Ridge Farm home pictures. I have seen absolutely every Little House on the Prairie episode as well as the reading the books as a child. I am definitely going to check out Homestead Blessings. I remember those snow days in the Ozarks… On year it was so bad we were out for a month. My Mom would take me into Springfield to the YWCA to swim… it was a old building downtown… don’t know where it would be… I miss home!!! Fresh snow is beautiful isn’t it? And the ice on the trees just glistens! I have been to Laura Ingalls Wilder’s home there in Missouri as a child. My aunt, now passed, was from Mansfield and her mother used to do gardening for Laura. My aunt used to tell me she remembered being at Laura’s home while her mother was there and being told stories by Laura herself. To her she was just Laura! I have always had an excitement in my heart for Laura Ingalls Wilder. Thank you for the memory! GORGEOUS posting, as usual! I love the freshly fallen snow and the ice sculptures that God sees fit to share with us from time to time! And, there’s nothing like the FRESH, CLEAN CRISP smell of that cold air. It bathes the earth and leaves her refreshed. Each season has its own special joys, and Laura Ingalls Wilder was very good at storytelling. I have good memories of reading these to the kids, what a warm time. Bless You! Joni G.
And, your little Summer is adorable, looks like she was enjoying herself! I haven’t seen the Homestead Blessings dvd’s yet. But I recently won their essay contest, and got 10 free dvd’s from Franklin Springs! They truly have wonderful films, and I highly recommend them! I loved this post! The tour of Laura Ingall’s home was great. I watch for your posts too. First of all, my best old friend from grade school is Ruth Ann, too, with a space, tho.!! Second, I made Hillbilly Spaghetti Pie for dinner last night and the gang loved it!! What a neat twist on the old mainstay!! We will be making some and freezing it to take with us to the hunting camp in two weeks!! I’m sure I’ll have to have recipes in hand!! I found you through Kellishouse, and am so glad I did. This post today is wonderful and I am going to check out these gals!! Thanks for adding some fun and delight to my day!! Beautiful pictures of the ice! It looks so lovely, and tranquil, but I am sure it wasn’t at the time. I love the coziness I feel stopping by your blog. Thanks for the warm hugs today! What a nice post! Thank you for sharing Laura Ingalls Wilder’s homestead pictures with us. I really like your home; you have done a really nice job making it “homey.” I can tell from here that you work really hard with a sweet spirit about you! Thank you for sharing your life with us with your blog! I was introduced to the West family through Jewel’s blog Eyes of Wonder. Such a treat. I’ll have to look for these videos you recommended. I spent last winter rereading the Little House books. They are classics! I love those DVDs. I first saw them on the NRB Network (we live in the country so we have Direct TV). I also love buttermilk pie. Thanks for the memories! I’m ready for it to get back to normal here. I live in Paducah, Ky….and wish my power would just come on. Your pie looks wonderful. We were set in our ways to go south for spring break but this whole Little House on the Prairie has changed our minds and we watched season 1 of it and decided to go there instead….we are really looking forwrd to our adventure. Thanks for the tour, I have always wanted to see Laura’s house! !I loved those books as a young girl, and my youngest daughter loves them too! Thanks too for the tip on the West Gals, love bluegrass and baking, so I will have to check it out!! Oh I am so glad you posted this. I am a huge fan of the Little House on the Prairie series. I even have a daughter named after her daughter Rose, this is my daughter Faith’s middle name. I too wish the walls could talk. I would have loved to have known Laura and been a neighbor. Thank you so much. I always love your posts and have been checking several times a day for an updated one. May God bless you and your wonderful family. Now I KNOW we are truly kindred spirits!! 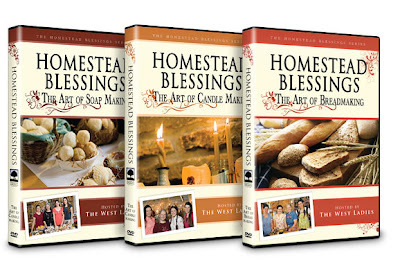 I too have the delightful Homestead Blessings DVD collection. It was a very sweet gift from my Dearest for Christmas. 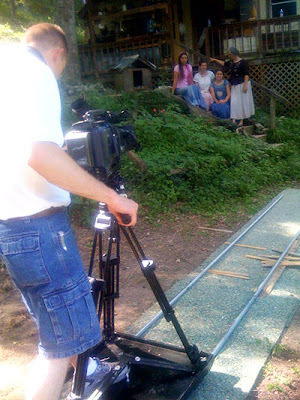 I just love the Franklin Springs Media website and plan to order a few more of their DVD’s soon. Thank you for sharing the lovely photos of Laura Ingalls Wilder’s home. I plan on visiting the website and oooohhing and ahhhing over the charming photos. I hope you are all safe and warm! Cain’t wait till you give the recipe the pie looks so delicious! I leave my computer on all day on your site so I can work to the music. It just makes me smile and work. I’ve been sewin’ an apron and justa goin’ to the music. I love that milk cow blues-how cute is that song?! a kindred in spirit in the south-Alabama.. and we even have a dairy cow too.. There is no better way to spend a “Snow day” than at home baking, watching DVD’s and snuggling with your loved ones. LOVE LAURA, LOVE YOUR BLOG. HUGS FROM MAINE. I found you through another blog, although, I had visited you several months ago, but lost your link when my computer died! I, too, have a Summer. She is Summer Lee and is 10 years old. I wanted her to be Summer Rose (Rose, after my mother) but hubby wanted her to have my middle name. Laura’s books have been my favorites and favorites of all of my children. I would love to visit her home some day. Thank you for sharing the pictures. I also would like to see those DVD’s. They look great! We homeschool and have for years, so I’m always looking for something new and educational. Your snow is beautiful. Living in Atlanta, we never get the really good stuff, just mostly the nasty ice storms which are a whole different ball game. My younger girls would love some snow this year, though. I think it would be pretty awesome myself! I love your posts! I, along with the other gals, loved the House on the Prairie books. I devoured them as a girl, and hope my dd will love them also! It was fun to see Laura’s homestead. It was also fun to read one of the comments from the gal whose aunt spent time there as a girl! Fun, the connections these blogs make! Also, I so enjoy the music on your site so much! Have a great day! I just love your blog. I have been to Laura’s house in Mansfield and just loved it. Wow, your spaghetti pie is delicious….Amy made it and brought us some….mmmmmmmh……. Thanks for all the good wishes about Amy’s pregnancy…she is experiencing some problems…please remember her in your prayers…. Hi! I often “stalk” about and today I just had to tell you, “Thank you!” You use your gifts in such creative loving ways. God bless! I loved this post – such beautiful pics of the ice and snow – while we are frying in a heatwave down-under. Lol! I tried your Hillbilly Spaghetti Pie a few nights ago and it was wonderful. Very yummy. We don’t normally receive a lot of snow here in Seattle, but when we do it usually shuts down our city until it is completely gone! So needless to say when we get snow here schools are all shut down as well and the kids are always thrilled…except for this year! They are all in college now and when they all arrive home on breaks they love to kiss us on the cheeks, give us big bear hugs and head on out to visit with all their friends. Well this Christmas Holiday came and so did all the snow and guess who couldn’t get out and drive around in the ice and snow!…lol I of course am in heaven having them home the whole vacation with ME! So I say, hip- hip- hurray for the snow! Now I am craving some pie…. I love EVERY blog you do. We had the first of the icestorm in Oklahoma. Glad you are thawing out over there. Can’t wait to see the pie recipe. All your recipes look like comfort food. YUM! Love your little Summer Rose. She is such a cute little girl. She is so blessed to have the family she does. Keep up the good blogging. Wish they were every single day! What wonderful memories I have of Little house on the Prarie. I still love to watch the shows on the Hallmark chanel. So very sweet. I was stopping by to tell you I am having a give away on my blog and I would be more than honored for you to stop on by and check it out. Oh RuthAnn, you are such a blessing and inspiration. I finally had time to go back and read the posts I missed when I was not I blogger (and had never heard of blooger;) and I love each one of them. The one that hit me the hardest was “…lipstick, aprons, and pearls.” I work nights and often feel a little beat down and unfortunatly I’m afraid I look that way too. In fact, unless I’m on my to work or church you will find me in sweats and no make-up. Well let me say, you have challenged me to make a change. My family deserves to see more lively, lipstick wearing version of me. Thank you for your words of encouragement. I recently discovered your blog, and you convinced me to get out my mom’s old hand me down iron skillet and start using it. Thank you. It worked great. I don’t know why I didn’t use it before. My mom is from the Ozarks, transplanted to So. California years ago. That’s where my family is, and where I grew up, although we still have lots of relatives back your way. I’ll be checking back often. I have always loved Little House on The Prairie! I’m going to have to check out the video’s that you mentioned too. Perhaps I’ll re-read some Laura Ingalls Wilder as well. You always do a fanatastic job! Thanks for always being so inspirational to us all! Love the post! Thanks so much! Oh what another wonderful post!! and again sweet sister, just another testament to how we are so alike :) I loved Little House on the Prairie!! I watched it for during my whole childhood, it was mandatory TV in my house :) Then when I got pregnant with my first child, I would watch it 24/7 in reruns just to see Carol Ingles as a Mom. I wanted to learn from her and my Mom included. It amazes me that you did a post on it, because it brings back such memories of eating saltines ( to get rid of the nausea , lol ) and watching it as my pregnancy progressed. I swear , that show had more influence on me as a Mom, than any other I know!! What yummy looking pie! Glad you’re all doing well after the storm! :) We just got barely a dusting last night, and they had a 2 hour delay down here in the South!! Those videos look really interesting, I’m going to check out that website — I’m all for promoting family entertainment!! Beautiful pictures of the ice and snow! Sounds like you had a fun time during your snow days. That pie looks delicious – can’t wait to see the recipe! Your pictures of the ice/snow storm are beautiful! I have to tell you, I have always loved the “Little House” books as well as the TV show and thought living in Laura’s time must have been fun and exciting. I believe the TV show certainly romanticize it however I’m certain there were a lot of hard times as well. There is just something about living a simple life style. The love of the family and wholesome values! I love the pictures very much! I’ve always wanted to live little house style. I am a huge little house fan and always wanted to see the Rockey Ridge Farm! I have a little sister named Ruth Ann. I LOVE reading your blog. Thank you for posting such great pictures and sharing your heart & soul with us. I feel like I know you and your sweet daughter! What a fabulous post. i really enjoyed the photos of L.I.W.’s home. Aren’t her books just the best. And, of course, i never missed any of the tv series, either. I still watch all the re-runs and just WISH our times were so simple. They had their share of the hard times, too, tho. ANYWAY, I am waiting for your new recipe…sounds good. I am excited as usual to see a new posting! I’m so loving this place you have made to share with all of us! Telling my daughter to check the site today as she is a big Little House fan! I LOVE the stove in Laura’s farmhouse kitchen! Oh the good old days……. The snow/ice pictures are beautiful. Indeed, every season has its beauty….I’m in Canada and we have plenty of snow…. This site is the highlite of my days! Bless You. I think little Summer Rose favors Laura in the picture you posted. I have never visited the Laura Ingalls Wilder home, but it is now on my list of things to do! As always, enjoyed every word. Have a wonderful week. If I haven’t told you before, I’ll say it now… I absolutely love your blog. And I so appreciate your love of God and how you always include Him in. I lived in Oklahoma before moving to Vegas and miss “home” so much. Your blog helps me stay in touch with all the things I endear about the midwest. Also, seeing the picture from Little House, caused me to go dig out my set of those books that I had collected while teaching. Sometimes it’s fun to go back and read children’s literature like that series. Now I’m just waiting for you to post the recipe for that delicious looking “Buttermilk Pie”. Can you send the snow down south? Love the wintery pictures. When my daughter was younger she was a huge fan of Laura Ingalls Wilder. OMG!!! What a fantastic post!!! All my life, I have wished I could have lived in the days of Laura Ingalls Wilder!!! I also plan, someday, to get up to the museum. Those DVDs sound wonderful, I’m off to take a look at that site and add them to my wish list! Loved your post!!! I STILL watch Little House reruns. They just don’t make shows like that any more. I was born in the wrong time, I could’ve been Laura’s best friend and next door neighbor! How awesome that you showed us her home. I had no idea!!! Wouldn’t it be fabulous to have been there with her. The house kind of looks like the one they recreated for the show, don’t you think? Well, now I’m in the mood to bake . . . so I’ll head on downstairs and see what I can come up with. Your blog is simply precious! We love everything about it!! May God Bless you and your dear family. I am sure you gotten a ton of these but because your blog has so touch my life I have to add to the many that award you.. I have awarded you on my blog if you like you can visit and pick it up! No matter when I visit, I always leave refreshed and blessed! The snow looks great, time to bake lots of pies and stews and all the other comforting things that make our homes smell so lovely to our family and friends. What a fun post…I’m not in an area that ever gets snow so I enjoyed reading all about it! The Buttermilk Pie looks delicious…I’ve never tried it before! hey lady! i’m still waiting for the day i see you being interviewed on joyce meyer! i just love you! you are so inspiring…keep bringing it! thanks for the fun post. i get the same way when i know impending weather doom is about to hit! i kinda like it when the power goes out for just a little while. I just had to leave you a note. I love coming on your blog and rereading them. I come away so refreshed and inspired and motivated to get my home in order. Thank you. You are truly a light in our world. Ahhh! I can’t believe you have Laura Ingalls Wilder photos! She is my all-time favorite and someone I want to meet in Heaven. Her books adorn my bedroom dresser. How wonderful that you live so close to where she did. I feel that she has inspired and touched so many hundreds of girls and women over several generations—what an inspiration. I definitely want to order the DVDs of the West Girls for my girls and me! They are women after my own heart—yours too, obviously! How wonderful—a life we dream of, really…living of the land and getting back to basics. What a lovely post, RuthAnn. HI Ruthann! I went to high school with Ashley!! How are you? I love your blog! I just started and am trying to get into this whole place! Love it…and I love the pics of your home, beautiful! I love your blog, and don’t even remember how I found it. I homeschooled for 14 years and have wonderful memories of one year working through a unit study on Laura Ingalls Wilder’s books, entitled Prairie Primer. It was memorable for my kiddos, too. Buttermilk pie is a favorite here in our home, and I’ll have to whip one up this week. you’ve always wanted a 42 year old daughter, right? I used to love watching “Little House On The Prarie” when I was younger. Micheal Landon was always a favorite of mine. Can’t wait for the pie recipe! Hello! Thanks for writing back! I found you through another friends’ blog and recognized your very top picture right away! How are you? I knew you moved, how do you like it? I cannot believe how big and beautiful Summer has gotten. I remember her baby pictures!! Haha… My kids are great…Kaelyn is 2 1/2 and Brandt is 9 months. They are just fabulous and the moment I held my daughter for the first time I looked at my husband, Kenny, and told him I knew that I had finally found what I was meant to do with my life! How is Ashley?? You said in a post below that you bought your one-size-fits-all-lid for your cast iron pan at the Kitchen Store. However, I can’t find it at their website. I even went to Lodge.com and didn’t see it there either. Can you help me more specifically on where I can locate the see-thru one that you found? I would love to have one. p.s. Your kitchen is gorgeous-I love the new fresh look. Beautiful! I enjoyed your post and pictures of Laura Ingalls Wilder’s home. I find her books to be a vivid look into the past. I have always loved old fashioned things. Woodstove cookery is one of my favorite things. Right now I have a pot of Corgi Cottage Soup on the stove. The receipt is in “The Tasha Tudor Cookbook”. I have had the joy of having the soup made from the author/artist/cook’s own hand… delicious! We hope you can stop by The Corgyncombe Courant blog. I have always LOVED Little House On The Prairie! Thanks so much for sharing this. Your Hillbilly Pie from your last post looks Yum-O! I look forward to your Buttermilk Pie recipe! and I have been waiting for this video to come out!! Very lovely post and fun music! I just wanted you to know that I am having a giveaway at my blog right now. I’m not “advertising” it anywhere else, but I think you might really appreciate what I am giving away, so wanted to let you know about it. It’ll be up until Sunday if you’re interested. God Bless, always enjoy your blog! Looking forward to your next posting! Hint Hint!! And also for your next recipe! I have stumbled upon your blog and have been anxious to read more ever since, your blog reminds me so much of my heart strings in the area I pray our homestead can be, look forward to your future posts.. I came across your blog and I have spent forever going through all your posts. I love the way that you decorate. I have been searching through all of your photos looking for inspiration. I would love to see more photos. I look forward to more posts from you. I am not far from Branson so I know all about the Ozarks! Hello. I feel like we are great friends just from reading your blog. I love it! I, too, love to celebrate my family and all the special things in each day I can find. Our girls are grown and in college in the lower 48 (we live in Alaska), but I love to have tea parties and share special events and times with the young singles and moms that belong to our church. But what I wanted to share with you was how much I loved your “Beulah” story. I think your whole concept of making stories for the photos is great. And I had a great Aunt Deck that lived in north Alabama. When she was in her 80’s, she still got up at 4 each morning to bake cakes (that was her love) and delivered them each day to someone in her church she thought needed a little extra TLC that day! Your story reminded me of that, and has inspired me to follow suit.By the way, if you have never made Chess pie, then that is definitely one for you to make-one of my favorites. Just wanted to tell you hello, and thanks, and ya’ll are in our prayers, too. Just to clarify- “John” is my husband! My name is Lesa (pronounced “Leesa”). The Google account is in his name… maybe I’ll try a different way of commenting, if I can figure this out! Oh what a great perspective on life you have!! A happy home truly is about realizing the blessings we’ve been given. If we could all remember that each day – each moment in fact, we’d be so much richer. Thank you for sharing, I am grateful! One remembers that humen’s life seems to be expensive, however some people require cash for various issues and not every person earns enough cash. Hence to get quick home loans or just term loan should be a right way out. I loved watching “Little House On The Prarie” when I was younger and still watch the rehearsels today. I come from Germany, and saw this side for the first time, an find you fantastic. Can’t wait for the pie recipe, and more recipes if you have. I stumbled upon this site on pinterest. I love all things Little House related. Scrolling down this post, Imagine my surprise when I see that were share the same first name, Spelled the same way..haha. Great post. Yes its an old post. But still enjoyable.